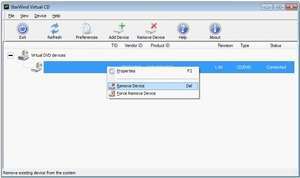 StarWind Virtual CD creates a virtual DVD-ROM drive locally to extend your computing infrastructure. A Virtual DVD-ROM emulation allows you to use virtual optical drives when and where you need them. You can create an ISO or MDS image from your CD/DVD or Blu-Ray/HD-DVD drive with any disk grabbing utility and save it to your hard drive. Whenever you need to read data or run applications from that image, just mount it as a virtual DVD-ROM drive in Virtual CD. For security reasons, you should also check out the StarWind Virtual CD download at LO4D.com which includes virus and malware tests. Additional screenshots of this application download may be available, too.